These are the spots to go! Portions of proceeds going back to the victims, families, first responders, and volunteers. Cigar City Brewing will start the Let’s Get Beers Together Session IPA next week at different locations throughout Orlando like Will’s Pub, The Hammered Lamb and more. All of the proceeds will go to the OneOrlando Fund. A dollar from every beer sold in the tasting room from Friday to Sunday will go to the OneOrlando Fund. Also, their distributor, Florida Distributing, will donate all of the proceeds from the keg sales. Wildside BBQ Bar & Grille will donate all proceeds from their “One City” burger to the victims and families of the shooting. Dine Out for Orlando United will take place June 30. Florida restaurants, their guests and employees will donate time and money by donating a portion of their sales, collecting donations or some similar way. All proceeds will go to the OneOrlando Fund. So far, Burger King, Tijuana Flats, Marlow’s Tavern, Cask & Larder and more are participating. Sweet City Gelato will donate 10 percent of profits and all of their tips to One Orlando Fund through the end of June. Sweet By Holly – through the rest of June, regular or gluten free Orlando Pride cupcakes available in Orlando and Jacksonville – classic size $2 each (50% of sales of this cupcake go to Equality Florida). We will be accepting orders for the special cupcake (regular or gluten free) moving forward but will not have them for sale in the store daily. For each dozen that is sold, we will be donating 50% to Equality Florida for the remaining of this month. Restaurant Ash and the Funky Monkey Bistro are donating 20 percent of their total sales on Thursday, June 30, to the OneOrlando fund. 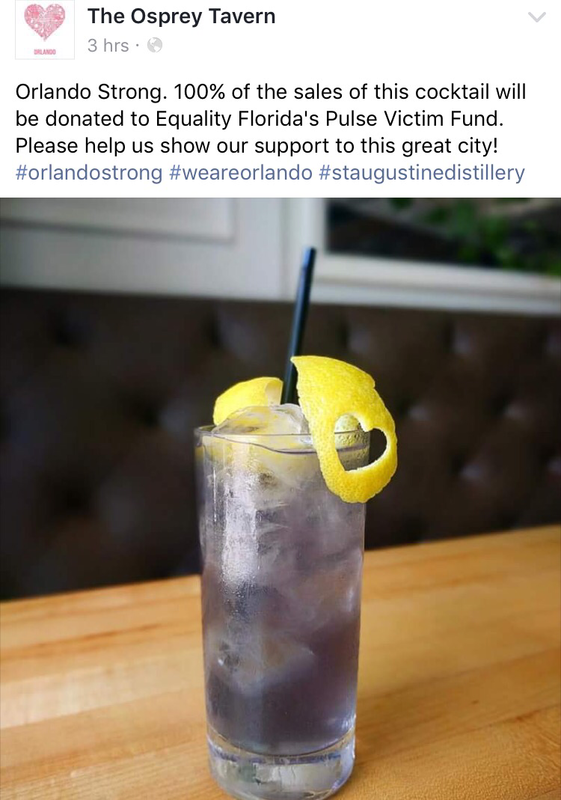 STK will be featuring the “Orlando Pride” cocktail in which net proceeds will be donated to the OneOrlando Fund at all of their locations. STK and The ONE Group will also be collecting donations from their employees. Ain’t Missbehavin Sports and Tiki Bar will be hosting a fundraiser for Pulse Employees on Saturday, July 30, at 3 p.m. There will be a pool tournament and raffles throughout, and all the proceeds will go to Pulse and its employees. They will also be accepting donations every day until the event. Sugar Daddy Bakery is offering Pulse Cupcakes, profits of which will all go to EqualityFlorida. If you’re interested, they ask that you order the cupcakes 24 hours in advance, since the cupcakes are baked fresh to order. Also, on June 30, they will be donating 10 percent of all coffee sales to Dine Out for Orlando United. ORL Food Lab On Tuesday, June 28, the ORL Food Lab event at the East End Market will be a fundraiser to support the OneOrlando Fund. The event is free to attend but donations are appreciated.